The MagicWave is a completely digitised TIG AC/DC power source that is used especially for aluminium applications. Alongside the different power categories from 170 to 500 A, the devices also vary in their mobility – from the portable device to the high-power stationary complete system. The MagicWave features an extremely robust design and an exceptionally self-explanatory operating concept. 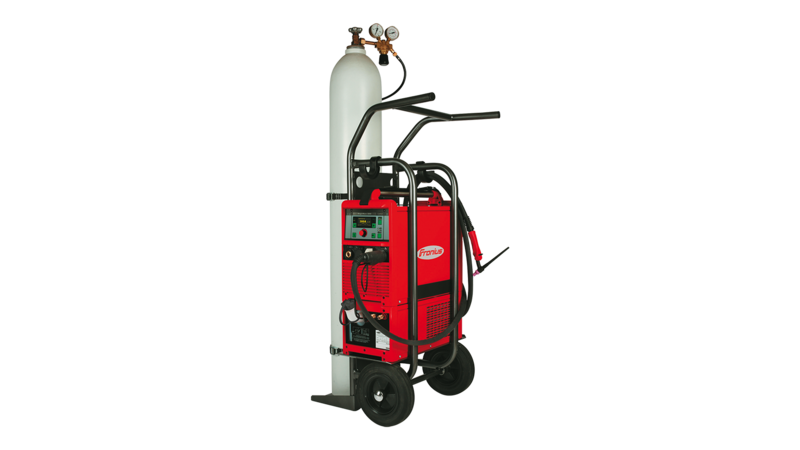 Active Wave makes TIG AC welding a much quieter business. The integrated digital signal processor always computes the waveform that will permit the highest possible arc stability with the lowest possible noise-emission levels in real time. Measurement of these noise levels clearly shows that with Active Wave, the dbA value is still below 80 dbA, even when the machine is delivering 300 A of power. With TAC, one spot is all it takes for tacking, because the pulsed arc sets the two weld pools in motion, making them jump together in next to no time, to make one single weld-pool. The TAC function is also very useful when welding light-gauge sheets without filler metal. The touchless and gentle high-frequency ignition is the easiest option for igniting the arc. Touchdown ignition can be used in particular for sensitive application areas. This allows electromagnetic interference, which can occur during HF ignition, to be avoided. This function enables automatic cap-shaping when welding aluminium, resulting in significant time savings. The user can set the size. The power sources are available in country-specific variants, meaning they can also be used in regions with differing mains voltages. For more information, please contact your local Fronius contact.